Todays estimated world population is 7.005 billion, as of 12 March 2012. When you look at the worlds population by continent by pie chart, its clear that the population is very unevenly distributed. With Asia containing over 60 percent of the worlds population. The world’s two most-populated countries, China and India, constitute about 37% of the world’s population. Also interesting, is that Brazil contains nearly half of South Americas Population. These statistics are reported by the United States Census Bureau. Which Continent is the most populated? Which continent has the smallest population? What is the population of North America? What is the population of Asia? 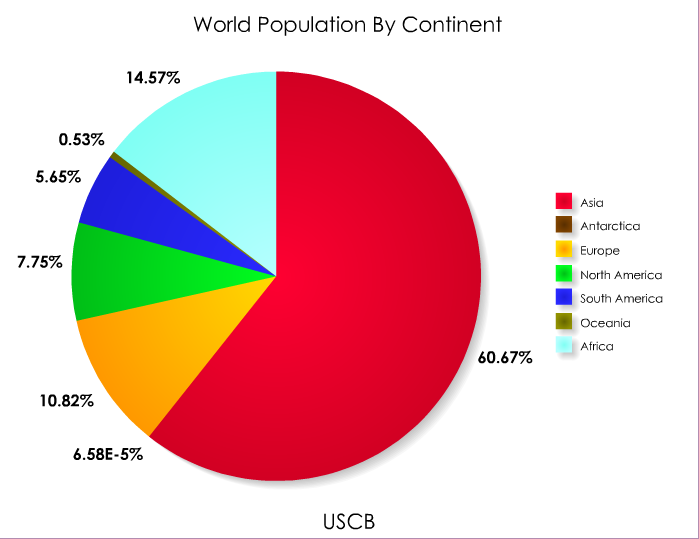 What is the population of Africa? What is the population of Europe? Pie chart of world population. What is the population of South America? What is the Population of Oceania? 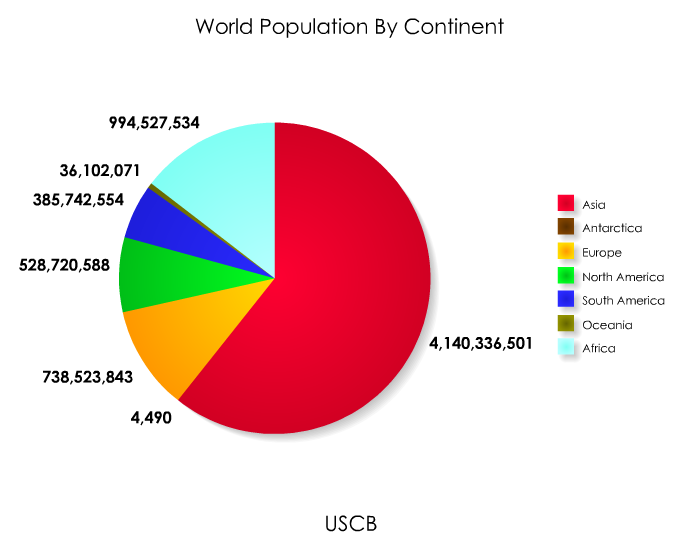 What is the population of the world by continent? Is North America or South America more populated? Interesting to see how Europe and the Americas haven’t been procreating in comparison to Asia. Personally, I like to completely separate India from China. India is a subcontinent that is so different from China. The high Himalayas have seen to this for a virtual eternity. Regardless, the stats say the same thing. Asia is densely populated my gosh. I wonder if Mandarin will outdue English someday. One advantage for English is that India’s educated class are all super fluent in it. Over the past two decades, China has really gotten their population growth under control. That is one thing I will truly give the Chinese credit for. The Indians, on the other hand, well, that is one multi-cultural basket that no government can tame. India’s is so much more magical to the senses and spirit, but politically, what a mess. If we make it past 2012, I would have to bet on Mandarin taking English over the next 2-3 decades. Remember, French used to be the internationally recognized diplomatic language, that changed in two shakes of a rabbits tail. Enter your email address to follow my blog and receive notifications by e-mail.